There are few details about this accident. On November 29, 1942, an army C-39 aircraft, (Ser. No. 38-516), with seven men aboard was seen circling the town of Bethel for about fifteen minutes before someone aboard fired a red flare. Then five parachutes were observed before the plane crashed in a wooded area. Two men had remained aboard the plane and were killed. Those who bailed out landed safely. Major Herman B. Leeth, 46, of Indianapolis, Indiana. Captain John F. Meehan, Jr., from Wyncote, Pennsylvania. Colonel George V. McPike of Hannibal, Mo. Major Robert V. Dunn, of Marion, Md. Captain Gerald Garrard, of Cordele, Ga. Lieutenant Ross De Lue, of Chicago, Il. A civilian, William Kurylo, of Middletown, Pa. 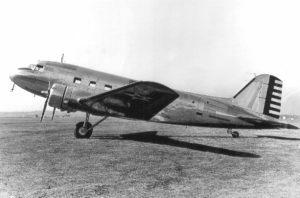 The flight had originated at the Rome Air Depot in Rome, N.Y. The reason for the distress flare and cause of the crash were not stated.